← University of North Dakota: Day Two – Cuba! 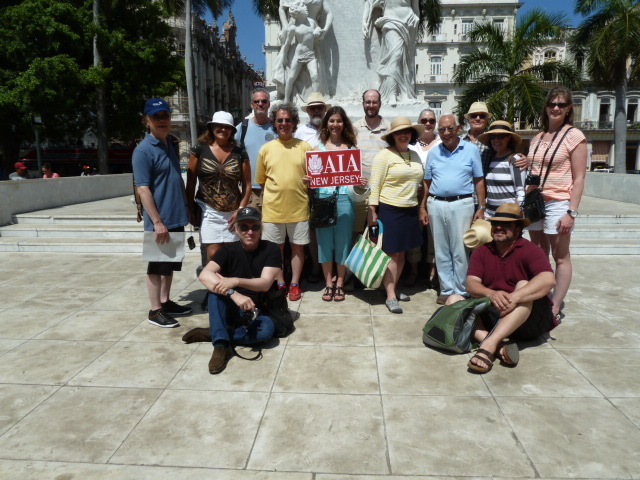 AIA-NJ with a delegation of 15 members has just returned from an 8-day tour of Cuba. The purpose of the tour is to observe the urban environment and architecture fabric of the cities and meeting with Cuban architects. The group was able share and exchange knowledge with Cuban architects to have a better understanding of the socio-economic impact to their cities. The information the group gathered will be shared with AIA-NJ Chapter and all the local 6 Sections. The group started the tour at Old Havana, meeting with Cuban architect Miguel Coyula international renowned architect, urban planner and faculty of architecture at Havana University. The Old Havana are known for many square or plaza, surrounded by cathedral, institutional buildings reflects Cuban baroque architecture. The Old Havana has been designate as UNESCO Heritage Site. Many buildings in Havana has been deteriorated over time, we met w ith architect and preservationist Isabel Rigol director of the national Center for Conservation, Restoration and Museology. The surrounding buildings included Capitolilio Nacional, Centro Gallego, Centro Asturano, Manzana de Gomez, Bacardi Building, the restoration work in a neo-renaissance building and experience the promenade of Paseo del Prado. The post revolution architecture included Instituto Superior de Arte, started from 1961 to 1965. The project was halted until Cuban government re-commission the work in 2001, the restoration work for School of Visual Art was completed in 2009. The Institute was part of the documentary film “Unfinished Space”. We also visited the Housing and Planned Community of Habana del Este, a 1500 unit planned community to address housing needs, it was built from 1959 to 1962. We were able to meet with Cuban architect Pedro Vasquez to observe various architecture from the Modern period. Pabellon Cuban an exhibit hall built in 1963, Hotel Habana designed by Welton Becket Associates convert to housing and governmental facility. Coppelia built in 1966, Hebrew Community center 1953 and Hotel Riviera in 1957 for Meyer Lansky. The Cuba is evolving, we have seen more restoration work in progress, however many classical buildings has fallen beyond repair. There are more and more privately owned restaurants “pardares” in the cities. There are more boutiques, bars, coffee shop, jazz club and art galleries in the city as well as in the suburb. We as a group of architects fully aware this is a very unique time to be in Cuba. Our hope is through the understanding from people to people that we will begin to see improvements in people’s lives.